UPND leader Hakainde Hichilema says he is not an angry man despite being in detention for four months on trumped up treason charges. And Hichilema says he has p aid the price for agitating constitutional basic rights through his four-month detention over alleged treason charges. Meanwhile, the opposition leader has also said he wishes no one to be imprisoned because prison life is so horrible such that even prison warders are prisoners. 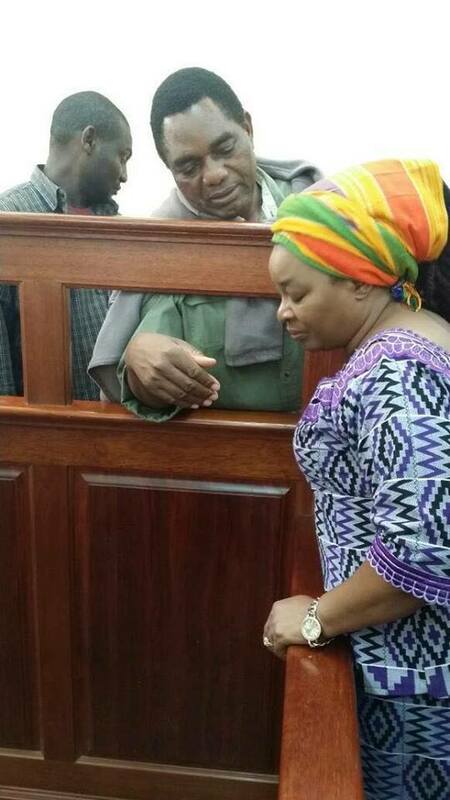 Hichilema, Hamusonde Hamaleka, Muleya Hachinda, Laston Mulilanduba, Pretorius Haloba and Wallace Chakawa who were arrested in April, charged with treason, walked to freedom after the Director of Public Prosecutions (DPP) Lillian Siyunyi discontinued their case on August 16. Featuring on Muvi TV’s The Assignment programme titled ‘Hichilema’s walk to freedom’ last night, Hichilema highlighted a litany of matters centered on his imprisonment at Lusaka Central Prison (Chimbokaila) and Mukobeko Maximum Security Prison in Kabwe but said he was not angry for his detention. He started the long-winded interview by saying he was “committed to dialogue to benefit this country, to benefit our region [and] to benefit Africa”. I was attacked like an armed robber here and I hope you saw the damage that was occasioned to our house. If I did not understand the role of leadership, I wouldn’t be sitting with you – I was going to be a very angry man. But I leave anger to others [because] God says if we are angry all the time, we’ll make mistakes. I don’t want to be angry and make mistakes; I want to use a bigger chest to find solutions to our problems. Asked by the programme host, Master Chimbala, how he intended to continue with his political life and running the UPND, considering that he and several others from his party were proclaiming that there was a diminished democratic space, especially for opposition politics, Hichilema responded that there was always a trigger point in a situation. The Bill of Rights clearly spells out that you shouldn’t be constrained to do your journalistic work! Would you now say that you are not going to claim for that space because it has been denied from you? No! Let’s use this opportunity [to demand for constitutional rights] because pretence will not help us. Things are not okay! God decides when things should crystallise and this is the time that things should crystallize so that we can now allow citizens to enjoy their rights. Take it from me; this is a window of opportunity! There is no need to do a makeshift agreement and sign it. Remember in March 2016, there was an agreement [to uphold peace in the run-up to the August, 2016 general elections] which was made and signed. I knew it was makeshift! Around the elections time, another one was signed [but] we must learn lessons because God gave us intelligence. We forgive but we don’t forget because we use the memory to correct the mistakes of the past. There is time for everything and this is the time to bring normalcy to our society. Asked on the relevance of him pressing on his struggle for decency in Zambia, instead of waiting for the 2021 general elections, the opposition leader wondered how political independence and multipartism would have been attained in 1964 and 1991 respectively if those who fought for such virtues relented. “If people didn’t fight for political independence, you wouldn’t be sitting in a house like this; you and I would have been sitting in some ramshackle somewhere because that’s what was right for us because the British were superior. Did you fight for independence? No! You were not born [yet]. Those who were born then fought for independence. In 1991, if those who were grown up then didn’t fight for multipartism to come, we’ll still have had a one party dictatorship today. So, who is Hakainde to fail to discharge his duties and obligations to society? So, I [should] come here and sit down! What do I do? People like saying ‘enjoy yourself’ [but] there is nothing to enjoy in the world. You cannot enjoy if your neighbour’s child is not in school; [it means] you are pretending. So, I think this is a generational responsibility; it’s our responsibility, yours through the media and everybody else’s to do that which is right for the living population [and] for those that will come after us,” Hichilema said. He confessed that he was feeling strange being out of prison because “for four months plus, I have lived in a tiny cell of two metres by 2.5 metres”. Four months [that I was imprisoned] sounds so long for me but how about those who have been in prison for 15 years? So, those who are saying I should just sit in my house…do we have the luxury to do that when people in these prisons are going through torture for 15 years and only to be acquitted? Then we would have failed in our duty to serve society. The question of me sitting down doesn’t arise! And Hichilema said once elected Republican President, he would have an obligation to do what is right to make people’s lives better, mainly freeing people who are erroneously imprisoned. “I’m not saying there is no crime; there should be general cases that people should be imprisoned [for] but the judicial process must be followed. Some things need to be done today, tomorrow, yesterday and others can be done in 20 whatever but there are emergencies and these (state of prisons) are some of the emergencies. It’s horrible inside there and I wish nobody to be in prison! Let me tell you; even prison warders are in prison [because] the conditions under which they operate [are terrible]. How do you look after 2, 500 prisoners when a prison was designed for 400 prisoners? How do you do it? The ration is for 500 prisoners but you are feeding 2, 500 prisoners. How do you do it as a prison warder? With a normal mind, you are also in prison. We really appreciate the media because without it, our story would have been buried,” he said. When asked to comment about his family and the value that he attached to it, Hichilema pointed out that there was no community that could survive without family life. “I want to say to you that I’m very grateful to this lady (Mutinta). I thank God for this lady and she is very strong. She’s strong in a responsible way; I’m indebted to her and I’m indebted to the Zambian women who, many times, are not acknowledged and I use this opportunity to urge other men to support their wives. She ran the family and she didn’t know whether I would be killed when I was taken to Mukobeko – you know [that] Mukobeko is renowned for people being exterminated. She kept the family! But she also was, in a way, in prison because she had to move between Kabwe and Lusaka,” said Hichilema. Meanwhile, Mutinta, who briefly appeared on the same programme, thanked God for preserving her husband’s life and the life of his co-accused. “It hasn’t been easy but we thank God that he is back; the children would have been here but they left yesterday for school. I also thank the people of Zambia for standing firm for us…. I thank the people in the media, both locally and internationally, because you were there for us and you heard my little voice when I cried. You were here to take the story of Hakainde to the world and if it were not for you people, my husband would have rotten in the prison cells. Because of your effort, you sold this story of Hakainde across the continent, across the nation and people came. I’m so grateful to you people and please, keep it up,” said Mutinta.